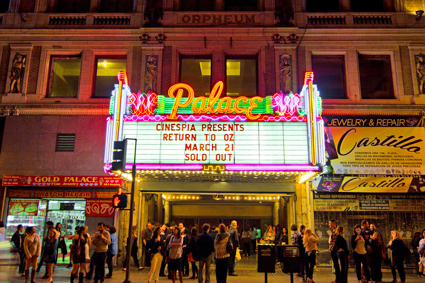 Year-round, Cinespia presents special film screening events at historic movie palaces in Downtown Los Angeles, commonly not open to the public. Events feature DJs, bars, concessions and the Cinespia Photo Booth. 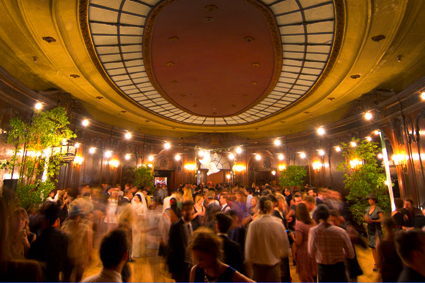 Our events give customers a chance to experience these beautiful venues important to the history of Los Angeles. Many films are presented in 35mm. No outside food or drink allowed. Most of our downtown events have pop-up concessions stands and bars. 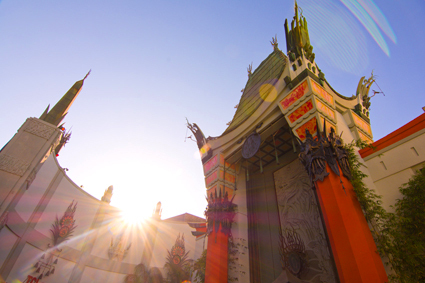 There are many parking lots available in Downtown LA within walking distance to the theatres. We highly recommend public transportation as most theatres are close to the Pershing Square metro stop. We will send an email out to ticketholders with parking lot and metro recommendations a few days before each event. You can choose to either print your ticket at home or download a barcode to your smartphone to be scanned at the gate for your admission. One ticket is good for one scan. It will not work on other scanners after being scanned. Seating inside is first-come, first-served. These historic movie palaces are set up like typical movie theaters with orchestra and balcony level seating. Seating is first-come first-served. If you have a Premium Ticket, you can sit in a reserved seating area. Look for signs or ask a Cinespia Usher. I have a Premium Ticket – what do I get? Benefits of Premium Tickets depend on the event. Most often you can skip the main entry line, receive a wristband for access to a reserved seating section, and skip the Photo Booth line. Check the ticket purchase page for details. Please show your ticket to a Cinespia Staff Member or security as soon as you arrive so you will be directed to the right areas. Can I just show my ticket at the gate on my mobile device instead of printing it out? Yes. Be sure to turn the brightness level on your phone or device all the way up and have your barcodes loaded before you get to the front of the line. What options do you have for large groups/parties? Cinespia does not offer group discounts at this time. If you are purchasing all of the tickets for your guests at once, we advise bringing a printed list of names of guests in your party to Will Call on the day of the event and ask your guests to check in there. Please have your order number and ID ready. I was charged for tickets but never received an email confirmation! Please contact TicketFly directly at customersupport@ticketfly.com or 877-435-9849. You can also try logging into your account at TicketFly.com to retrieve your tickets. Cinespia Will Call has a list of all ticketholders at the front gate. Please check in with Will Call on the day of the event if you have lost your ticket. Do you accept tickets purchased through third-parties? No. 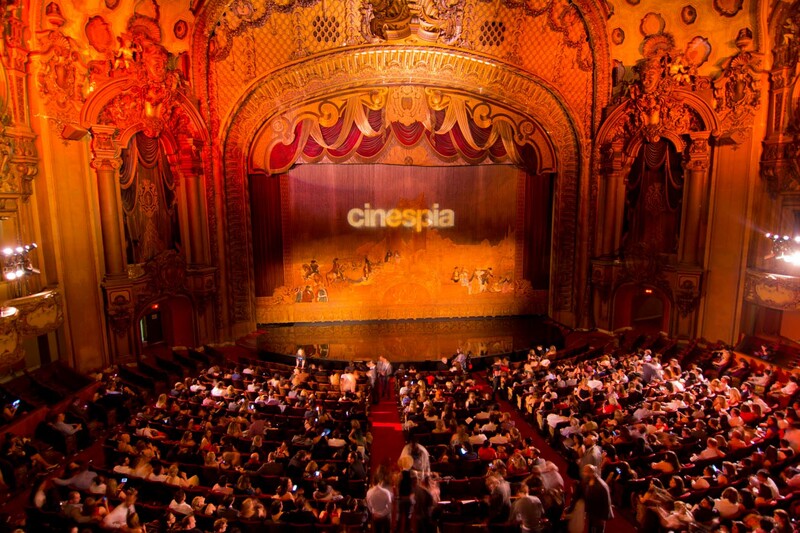 Unlawful sale or attempted sale subjects tickets to Cinespia events to revocation without refund. Tickets obtained from unauthorized sources may be invalid, lost, stolen, or counterfeit and if so are void. Please check in with a Cinespia Staff Member the night of if you have lost an item. Otherwise please email us at info@cinespia.org. Cinespia is not responsible for lost or stolen items. Unless otherwise stated, Cinespia’s Downtown Events are 21+ due to liquor license requirements.